oupChris from Mele Cotte is our host for this edition of Weekend Herb Blogging. This week I'm looking at a vegetable with a most confusing name. 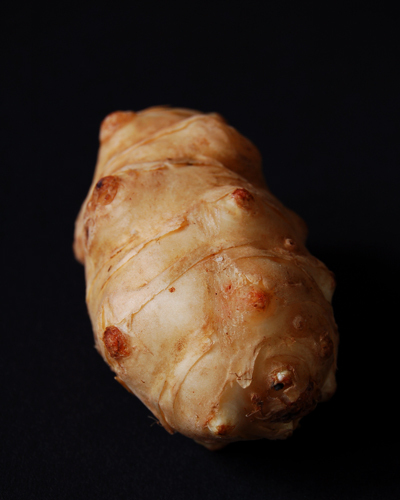 It may look a little like ginger but it is in fact Jerusalem Artichoke. It has no connection to Jerusalem nor is it part of the artichoke family. It is actually a native plant of North America and a member of the sunflower family - it is also known as Sunchoke or Topinambur. Nutritionally Jerusalem Artichokes contain Vitamins A, B6, C, E, and K, Folate, Niacin, Pantothenic Acid, Riboflavin and Thiamine along with essential minerals that include Calcium, Copper, Iron, Magnesium, Manganese, Phosphorus, Potassium, Selenium, Sodium, and Zinc. When selecting Jerusalem Artichokes look for those that are plump and unblemished, avoid those that look to be dried out or limp. There are many ways to use them and unlike potatoes they can be eaten raw. They do have quite a distinctive taste and if you are unsure about them, try adding a couple to a favourite potato dish. They can be roasted, boiled, mashed, fried, indeed they are a very versatile. I've opted to make a soup as I want to focus on their taste. To a base of leek and garlic I've simmered Jerusalem artichokes in milk rather than stock, to give a more creamy result without actually needing to add cream. Heat a little oil and butter in a saucepan over a low heat - when the butter has melted add the leek and garlic and sauté very slowly for a few minutes. The aim is just to soften the leek and garlic without colouring. Wash the Jerusalem Artichokes well - you can very sparingly peel them but it's not necessary as I will be straining the soup after it's blended for a smoother result and this should remove any excess peel. Cut them into small chunks and add them to the softened leek mixture. Toss through and cook for a couple of minutes before adding enough milk to cover them completely. Simmer until they have softened. Transfer to a blender and blend until smooth. Pour through a fine sieve into a clean saucepan. Taste and season with salt and freshly ground white pepper. 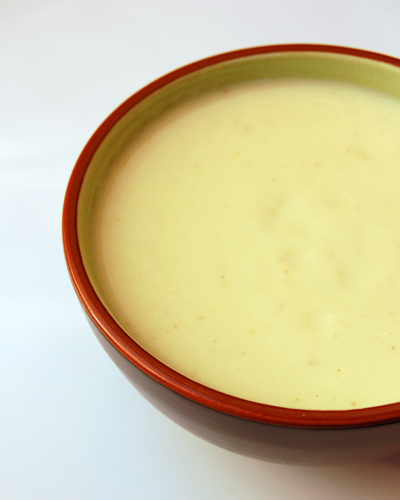 If the soup seems too thick you can add a little more milk and simmer until it reaches serving temperature. 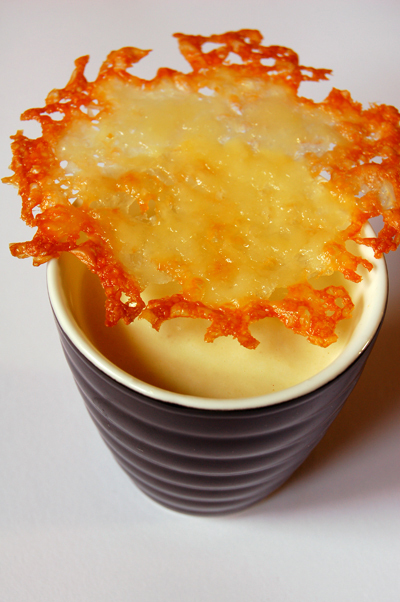 The soup has a most interesting smoky taste and to complement this I matched it to a "cheese biscuit" made from grated Sardinia Pecorino. 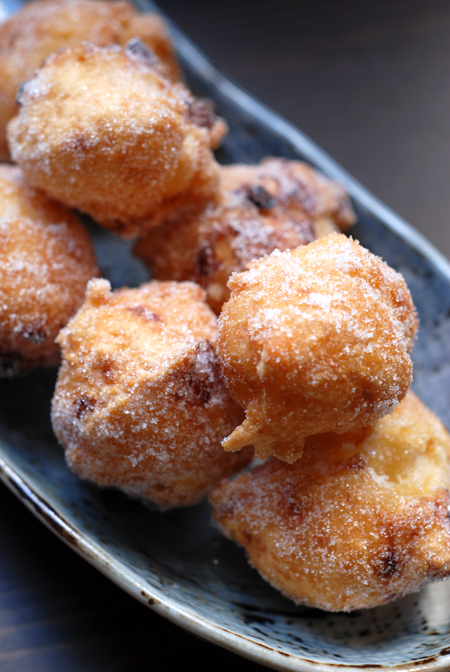 The biscuit is simply made by forming rough circles of grated Pecorino onto baking paper and then placing them under the grill to melt and brown. Once they are done to your liking you let them cool on the paper until they are firm enough to lift off. Love your site - the photos and recipies are great. Just a word of warning though about the soup, some people may be affected by a carbohydrate in the artichokes that is not digestable. Can result in some embarrasment if you are not expecting it! Thanks Anon - ah yes I think you are referring to the "gas" issue, they are a bit like beans in that respect. Haalo - This look delicious! I will just be sure to grab some Bean-O before eating one of this lovelies! I've never tried these and they're definitely something I've been curious about. Every week you come up with something just amazing. 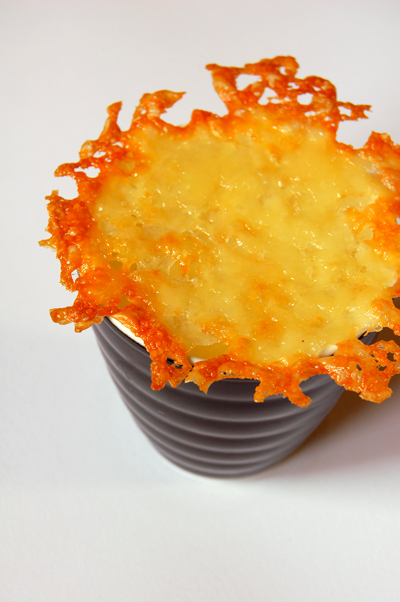 The cheese crisps to go on the soup are just the perfect touch, and so beautifully photographed. That's a great photo of the soup with the cheese crisp. I've not tried making soup using Jerusalem artichoke so thanks for the tip about starining it with a fine sieve. The one i'm planning on making is garnished with a Chestnut and Vanilla Bean Cream! Hooley dooley, it should be good!! Thanks Kalyn - they are one of those vegetables that I enjoy at restaurants but don't buy that often to cook at home. I don't know why because I do enjoy them. Thanks Christianne - everything is available in LA I'm sure of that! Thanks Adski - certainly sounds like it will be a great soup! I have only recently heard of these, but have never tried them. Your photos are amazing - especially with that cheese crisp!! Haalo, wonderful post as always. I had bought a "fartichoke" once, thinking it was fresh ginger! Not quite the desired taste or texture in my dish that I was preparing. Your dish looks perfect however and I must try it. I just hope I don't come home from the supermarket with a bag of ginger instead. i shamefully admit i've never had jerusalem artichokes before! Thanks Deborah - they are in season in the US from late summer to mid February so hopefully you can try them! Thanks Pam - love the nickname and the story, they can be difficult to tell apart. Hi Jaden - what a perfect time to change that! Hi Haalo. This soup sounds delicious, and reminds me of a jerusalem artichoke soup I had at Interlude recently. Beautiful! Thanks Duncan - look forward to seeing your review of Interlude. Sorry haalo, i have removed your pic, and rewritten the recipe. hope it is different enough now. i didn't think anyone and mean anyone looked at my blogg.How did you come accross it? I had originally had your full recipe on with a link to you, but when I went to make it I didn’t have enough artichoke or a leek so I made do and made it up as I went, I shouldn’t have keep your pic on and should have rewritten the entire recipe not just the bits I changed. Hope you can forgive me!!! !